We were staying over at a hotel in Ascot, so on the way back we decided to try out a Roast somewhere new. After a search online, I found The Black Swan in Ockham. 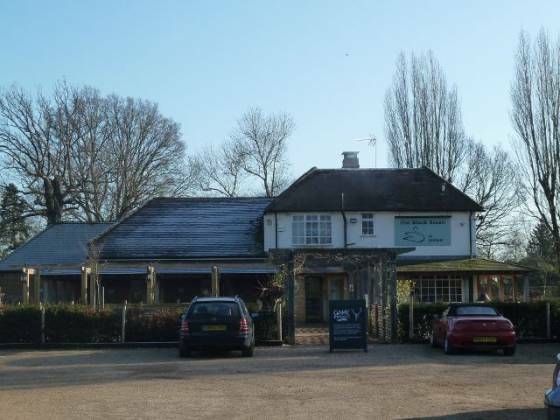 From the site and the various images on their website, it looked an interesting pub / restaurant to visit. The prices were on the high side (£16.95 for Roast Venison, £15.95 for Roast Beef and £13.95 for Roast Lamb – this is actually incorrect on their website, please see above for proper pricing). Booking was very easy, the website uses Open Table so I could reserve a table for 12:45 without any problem, receiving an email to confirm. I also received a call on the morning to check that we are coming – a nice touch, although I suspect this was due to them being very busy. Driving down country lanes, we found The Black Swan on the corner of an intersection. It was surrounded by fields, an amazing situation. The carpark was large, enabling us to get an easy parking space. The entrance was very inviting, with a blackboard sign advertising “Game Fortnight” – not lots of Scrabble competitions but various game meats available. Going through the double doors, there was a couple of armchairs on the right, in front of a roaring fire. As we were half an hour early, I went to the bar for some drinks for us to relax in front of the fire on the sofa, read some Sunday papers and wait. At 12:45pm, we wandered over to the reservation desk and were shown to our table. We were given a menu each and I was presented with a wine menu. As Claire wasn’t drinking and I was driving, we still had our soft drinks from the bar, so decided against wine. We were brought a glass bottle of water for our table. 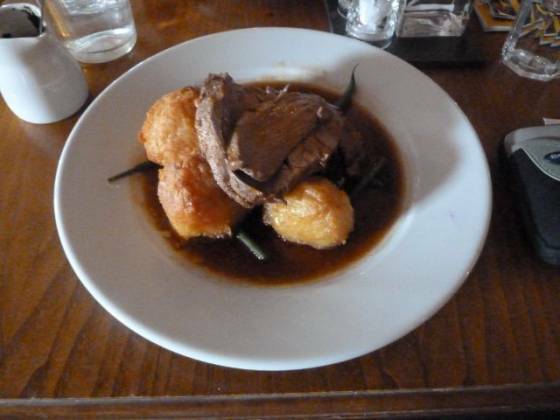 After perusing the menu, I decided on the Roast Beef, Claire went for the Roast Lamb. It was a real shame about where we were sitting. There seems to be two distinct sides to The Black Swan, a “pub” side, with low ceilings and a “restaurant” side with high ones, and wooden beam. We were sat in the pub side, on a VERY small table (we would have had to eat at an angle to get our plates on to the table). Thankfully, after about 10 minutes, a (proper sized) table became available and we moved straight away (without any fuss). Unfortunately, the acoustics were all wrong and we had some difficulty hearing each other talking – the pub was extremely busy. Overall, whilst the pub looked great I would have preferred to be in the restaurant area where I think the sound would have been a bit lower (I’m getting old). In the corridor before the toilets, there were some nice photographs hanging up on the walls of what appeared to be the various stages of The Black Swan being refurbished / rebuilt. The toilets were very fresh and clean. Our food arrived after about 15 minutes. 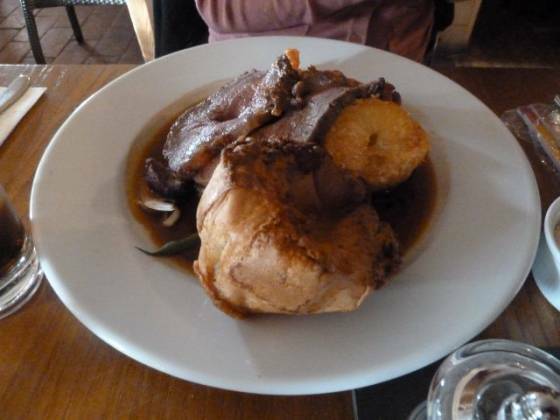 I really actually fancied the Roast Lamb, and Claire was happy with the Roast Beef, so we swapped :-) But, I got to keep the Yorkshire Pudding (thanks Claire!). We also requested horseradish and mint sauce. The serving was deceptive, with a lot of the “trimmings” hidden beneath the meat. We both had two, very thick, slices of meat, and 3 quite large roast potatoes. Vegetable selection was a bit strange, I’ll come on to this in a moment. Firstly though, the meat – quality seemed to be excellent, my lamb was moist and succulent (although “medium to well” cooked”), the mint sauce was nice too. I tasted Claire’s Roast Beef and it tasted great – cooked “medium”, just how I like it! Claire would have preferred “medium-well” though. The Yorkshire Pudding was good, nice and crunchy with a good flavour. The roast potatoes were divine. I have never had such crispiness with potatoes, I almost needed a chisel to cut them, and yet they were still nice and smooth in the middle – fantastic! After our roast, we were brought the dessert menu. Whilst on the high side of pricing (at £6.25 per dessert), it all sounded extremely tempting, such as Treacle Tart, or individual Eton Mess. 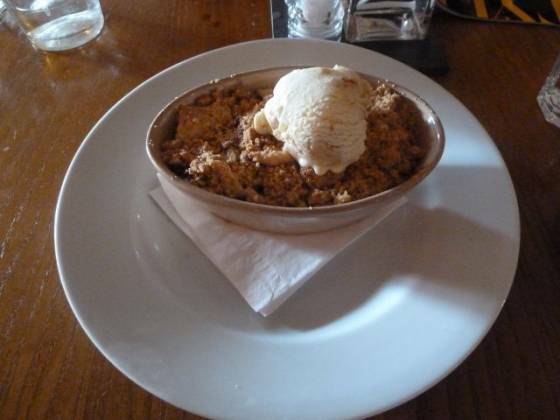 I decided on the Apple & Blackberry Crumble with Ginger & Rhubarb Ice Cream – it just sounded to interesting not to have. It did take a while to arrive, but when it did, wow! I know I lambasted The Bickley for serving too large a crumble, and I have to make a note for the same with The Black Swan. The crumble was H-U-G-E and the ice cream was just one dollop in the middle. The crumble topping was really nice, perhaps almost as good as how my Mum used to make them (or even myself once upon a time). The inside tasted wonderful, nice, light and a beautiful flavour – I have never tasted a crumble so good! The ice cream was nice, but to be honest I would have been happy enough with two scoops of vanilla instead.